KESWICK, VA -- I've always surmised being around crowds is over-rated, but now I'm sure of it. Every time I journey to Costco or the supermarket, it's always the same -- playing 'cart chicken' to make it down any of the spatially challenged aisles, then piling behind fifteen people in line to pay for the stuff -- and a single checker who can't seem to count to ten. It definitely makes human companionship a little less essential at moments like these. Let's face it, there are times where you just need to get away -- to isolate yourself from humanity. It's more than just a break from the daily routine; it's a breather from the hordes of people that make life's grind what it is. After all, if we lived in a world where everyone else met our fullest expectations, we wouldn't need a holiday in the first place. For those seeking the anti-multitudes experience, there's a place that's civilizations away -- Keswick Hall (an Orient Express Hotel), just minutes from the beautiful city of Charlottesville, the University of Virginia, and perhaps the most famous historic residence in the United States, Thomas Jefferson's Monticello (alright, maybe the White House and Mount Vernon would rival its notoriety). 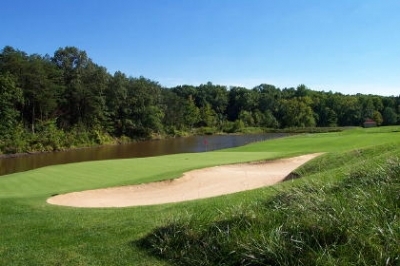 Right from the start, you'll realize that a round on Keswick Club's golf course won't be your typical golf experience. Keswick, in many ways, defies description. It's located near the town of Shadwell, named for the estate of Peter Jefferson -- Thomas' father. Jefferson once called the area the 'Eden of the United States.' Far be it from me to refute the Father of American political thought -- and when it comes to this part of Virginia, he was absolutely right. Adam and Eve would've done well to settle here. The 600 acre Keswick Estate not only boasts incredible luxury and the 'set-apart' atmosphere, distant from people, it's got an incredible Arnold Palmer signature golf course to help you escape from crowded golf reality for a few rounds. 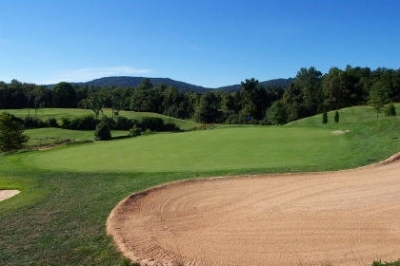 The course features the same varied topography that you'll find everywhere in central Virginia, but also offers something that few destinations anywhere can muster these days -- seclusion. Eric McGraw, Keswick's Head Golf Professional, sums it up. He mused, "When I want to get away, I really want to get away. It's not that I don't like people -- in my job, I deal with lots of different folks everyday. I love being around them, truly. But when it's time to take a break, I want to go someplace where I can take some time, smell the roses, and relax for a few days." I understand the impulse. Commuting on the freeways around Washington, D.C makes me want to vacation on the moon -- but even that's too intimate at times. In contrast, the Keswick experience is more than just a dream -- it's an ideal. Water guards the entire right side of the par three sixth hole. And if you hook it into the tall rough, you probably won't find it. 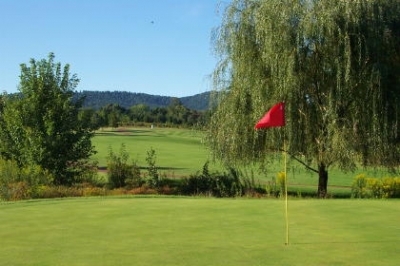 Keswick Club's about as close to a personal golf course as you're ever going to get. McGraw adds, "We don't have a starter, because we don't need one. We don't have course marshals, because we don't need them. We don't even really make tee times, because there's no push to send out people at seven or eight minute intervals. 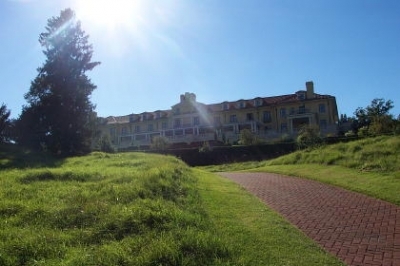 Our course is open to members and hotel guests only, and since our hotel capacity isn't large, it guarantees the privacy on the golf course that we're so much in pursuit of." Now I know what Jefferson meant when he wrote that our inalienable rights included 'life, liberty and the pursuit of happiness' in the Declaration of Independence. Little did he know, 226 years later, that the 'pursuit of happiness' could be found just a few miles down the road from his Monticello on the golf course at Keswick Hall. Keswick's golf course originally opened in 1939, a product of the fertile mind of Scottish-born course architect Fred Findlay, who's probably more well known for his work in Virginia than he is for his significant ancestry. But that's perhaps fitting, since this region of the country reminds us that folks who came from across the pond really did mold themselves into blue-blooded Americans. 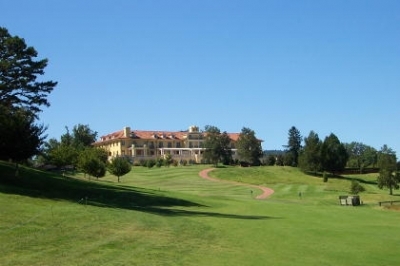 In the early nineties Keswick Club was upgraded and modernized by the Arnold Palmer group. Palmer essentially redesigned the green complexes and added bunkering, leaving much of the old routing intact, with a few exceptions. Looking towards the hotel -- with some impressive bunkering guarding the trip home on the left side of the 18th fairway. 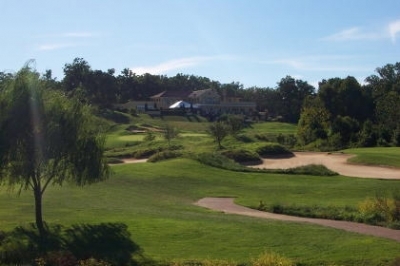 McGraw says the changes made Keswick into an old-style golf course with a modern-day look: "When you first see the layout, with its undulating greens and sculpted bunkers, you'll think it's got to be of a more modern vintage. But then as you make your way around the layout, you'll realize that the course has been there quite a while -- which it has." It's the combination of the old and the new that adds a lot of charm to the course -- and the fact that it's there just for you. We had a single following us the day we played, but there was many a time when there wasn't a soul around. 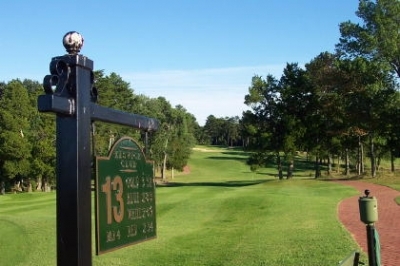 The fairways are bordered in some spots by large luxurious homes (and even a few horse farms), but the open rolling nature of the course with a healthy dose of trees in places provides all the isolation you'll need from people. It'd be a good place for a poetic recluse to find inspiration. Henry David Thoreau would've thrived in this neighborhood. The course plays longer than its 6307 yards, and much more difficult than its recently re-sloped 130 would indicate. The fairways are fairly tight (though it can be forgiving if you miss on the correct side), the greens are very undulated and fast, and tall grass will steal your golf balls on occasion. It's very much of a placement golf course. The picture doesn't show it, but the 11th green is very severe. Though it's a short par three, if you're not close to the hole, watch out. Approach shots to the greens is where Keswick really demands precision. As McGraw pointed out, most of the putting surfaces seem to be uphill on your greenward shots, so proper club selection is vital to get close enough to make pars. One last word of advice -- stay below the hole -- or your next putt will certainly come from that direction, six or seven feet by. But Keswick's classic layout is also friendly in much the way you'd expect an older course to be. Since it isn't long, you'll have choices off the tee -- and a good many of the boxes are elevated to allow you a little extra lift to the fairways. The wooded areas are also cleared out where they appear, so it's possible to recover if your ball makes sawdust on its landward fall. And the conditioning is excellent. Palmer said these could quite possibly be the best-conditioned greens on the east coast -- but we'll have to leave that to a future test, since they were aerated just a few days before our visit. The rest of the course, it's safe to say, was in tip-top condition. The round begins with a relatively tame par five, 511 yards and downhill -- an easy par if you can hit a tee ball straight. There is a stream that runs diagonally through the hole about 300 yards from the tee, but most likely you'll be given the choice to hit driver if you like. 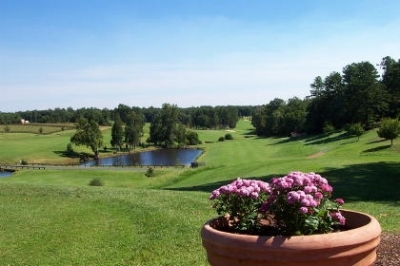 Standing on the 12th green, you'll grasp the beauty of the surrounding countryside -- and some of it is near at hand. Two's a very classic looking par four, with a downhill tee view rising up from a low bend to advance uphill once again towards the green. There's a stream that's not visible from the tee that requires a 235 yard carry from the back tees -- if you choose the layup option, you'll still only have a mid-iron into the green. Five's an extremely tough hole, a 426 yard par four with a tee shot that looks like you're firing through a gauntlet of trees. If you club down off the tee, you'll leave a long iron or fairway wood uphill to the green -- and that's assuming you find the fairway. There's tree trouble right and left, and a stream short. Nine's a challenging hole to finish up the outward nine. 433 yards in length, the fairway slopes right to left, leading down to a treeline and a pond if you go in that direction. Even if you hit the fairway to the right, you'll have a long iron into an elevated green protected by tall grass to the left and a bunker to the right. Arnie must've been in a foul mood when he dreamed up this tough test of golf. The backside plays shorter, but hardly less difficult. The sign and the cart path lead to the green of the short par four 13th, but play it smart, and layup off the tee. Ten's one of several short par fours on the inward nine, playing even shorter than its 310 posted yards, because the tee ball is downhill. Not really a drivable hole, since the green's elevated -- go the safe route and hit a mid-iron off the tee and a short iron in. This is one of those greens where you'll need to stay below the hole, or bogey's almost certain. Eleven's a short par three, only 140 yards -- but the green will make an honest duffer out of you. It slopes severely from back to front and right to left -- making it a very difficult two and even a hard three if you're not close to the pin or above the hole. Holes twelve through fifteen offer probably the easiest stretch on the course -- some shorter holes where placement on the second shot (or third, for the par five), again, will make all the difference. Sixteen's the longest par three at Keswick Club, 192 yards from the tips and a full carry, because the green slopes front to back. The day we played it was into the wind, making it seem a fair amount longer. One of the tougher par threes I can remember. Afternoon shadows obscure the 18th hole, but there's danger all around -- and that's clearly obvious. Eighteen is a classic finishing hole. Standing on the elevated tee, you've got bunkers and the driving range to the right, and a lake and bunkers to the left. In the distance is Keswick Hall, dominating the hill above the course. What a view -- and we played it close to sunset, so that made the scene even more spectacular. The hole itself features a very wide landing area, despite the trouble described above. The second shot, as usual, is where the challenge lies. I hit the green in regulation, but left the ball about 20 feet above the hole. My next putt was about the same distance back up the hill. I left with a six. Hard green to putt. But it didn't spoil the round. Keswick Club's a tough course to score well on, mainly because your mindset is probably telling you that you should be doing better. But you didn't come here to be pampered on the course -- leave that to the service staff at the hotel or the spa. Keswick, quite simply, is an experience that you just won't find very often. So next time you want to take a break from the crowds, partake in the pursuit of happiness at Keswick Hall -- and don't be surprised when you catch up to it. In addition to the great golf at Keswick, the hotel itself merits special elaboration. The first thing you'll notice is the hotel building bears little resemblance to a hotel -- it's more like a large private residence. You'll feel as though you're making a visit to a wealthy country estate when you're greeted with the Italianate architecture and the opulent landscaping surrounding the hotel property. 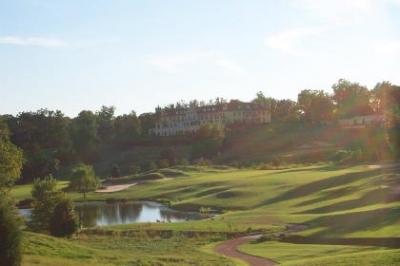 Keswick Hall dominates the hill overlooking the course. Keswick's incredible service begins as soon as you reach the front entrance -- the bell staff is very attentive as well as friendly (the bellman even asked how my journey was). The 'front desk' for check -- in is an actual desk, and the greeting area presents an abundance of tasteful treats for the eyes. Every need is catered to upon arrival -- no desire is left unattended! Adding to the uniqueness of Keswick, all guest rooms and suites (48 total) are set in different themes and d�cor, much like you'd find in a 19th century colonial mansion. If you've ever wondered what it would be like to visit the landed gentry in the days before Revolution, wonder no more. And the best part about it is -- you'll still be able to enjoy modern conveniences! Our room's bathroom facilities contained a large shower and a detached Jacuzzi tub, the perfect way to relax after a day spent taking advantage of all Keswick has to offer. Golf is only part of it. There's tennis (five clay and hard surface courts), swimming (25 meter lap pool), a complete exercise room, complimentary bicycle rentals, croquet, fishing on Broadmoor Lake (southeastern part of the estate), games, horseback riding and even hot air ballooning if you arrange for it in advance. Not to be missed is the Spa -- a full service facility to pamper as well as restore. For those non-golfers in your party, the Spa's a great place to get away from it all, and several packages are available substituting Spa services for golf privileges! Finally, the cuisine at Keswick will rival that found at the finest restaurants and resorts. We were fortunate enough to take breakfast downstairs in one of several comfortable dining rooms -- a treat for the sensibilities as well as the palate. It's all part of the overall presentation that coming to Keswick represents. A stay at Keswick will not be inexpensive, but that doesn't mean you won't receive excellent value for your outlay. If you're looking for a tasteful escape into the finest times of past and present, then put Keswick on your calendar for a visit. Director of Sales and Marketing: Doug Camp. $100. Several golf packages available in conjunction with a hotel stay; includes use of Spa and all club facilities-and includes greens fee for the entire day and unlimited range privileges (cart fee extra for replay).